1. Added a Time Lapse menu to the camera, allowing you to change the resolution without the app. 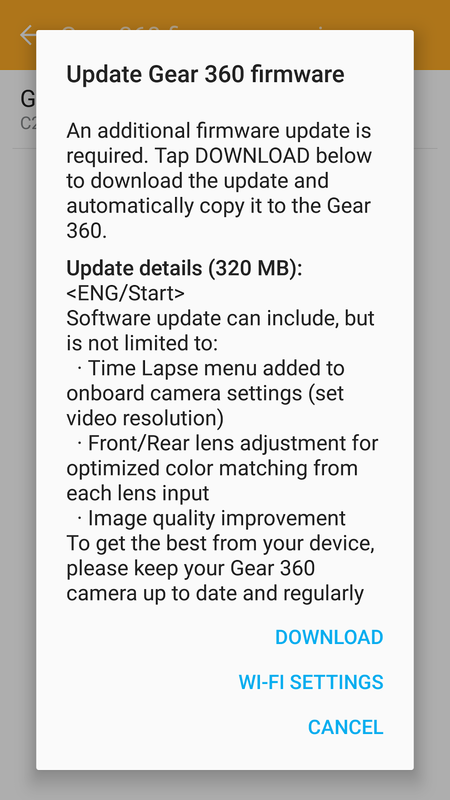 Previously, there was no way to change any of the settings for the time lapse except with the Gear 360 Manager smartphone app. 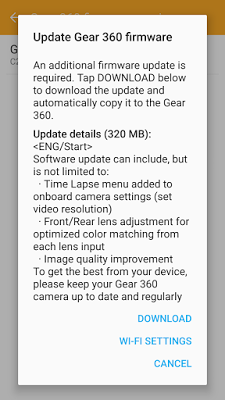 Insofar as these changes would require a firmware update (not just an app update), I’m supposing this means the app will also update the firmware automatically. 2. Improve the matching of color between the front and rear lenses. If you look at the sample video I posted, you’ll see that there is a slight difference in color between the front and rear lenses, which makes the stitch line more noticeable. This change appears to be intended to remedy this issue. However, I haven’t tried it. 3. “Image quality improvement.” I’m not sure what the improvement is exactly, but I will take new samples to test this. I’m working on a detailed review of the Samsung Gear 360, which I hope to post by tonight. The review might not take into account the new changes. I’ll just update the review when I’ve tested the changes.